An RSS feed (or news feed) is a means by which you can stay informed about what's going on at Potomac Harmony Chorus without having to regularly visit the website. Who is Potomac Harmony Chorus? We are the Potomac Harmony Chorus, an award-winning 50-singer a cappella barbershop ensemble. A chapter of Sweet Adelines International, we are women from all over the D.C. Metro area: students to seniors, working professionals to retirees. Together, under the leadership of Master Director Ozzi Mask, we make extraordinary music and memories. Potomac Harmony performs a variety of music from Broadway hits to fifties favorites to modern jazz, all in four-part harmony, barbershop style. In doing so, we preserve a uniquely American art form. We offer something for all audiences to enjoy and we love to entertain! We rehearse every Wednesday evening at 7pm, in the basement auditorium of The Hermitage of Northern Virginia, 5000 Fairbanks Ave, Alexandria, VA 22311. Email us or call 703-764-3896 for more information! Thanks for supporting our holiday shows! Looking for the full chorus, a small group, or a quartet for your event? We'd love to sing for you! When you click on this link, all your Amazon purchases for the next 24 hours help support PHC. We'd love to have you come visit a rehearsal and see what Potomac Harmony Chorus is all about! 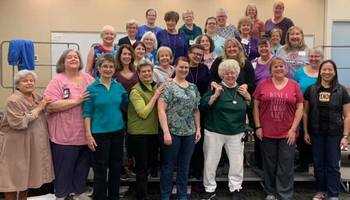 A chapter of Sweet Adelines International, Potomac Harmony Chorus is supported in part by Arlington Cultural Affairs Division of Arlington Economic Development and the Arlington Commission for the Arts. Potomac Harmony participates in CultureCapital, Your Link to the Arts In Metro DC. Want Potomac Harmony Chorus to sing at your next function? Why not hire Potomac Harmony Chorus to entertain at your next event? We can perform at corporate functions, charity events, community Entertainment events, birthday parties, holiday parties, awards nights, weddings, engagements, anniversaries, engagements, and even funerals and memorial services.